Isaac Svensson, a member of Long Beach Public Media's Board of Directors, listens to the station shortly after hitting the switch on KLBP from a tower at the Port of Long Beach. Courtesy LBPM. After years in the works, Long Beach finally has a multitude of local voices emanating across the city’s airwaves through Long Beach Public Radio (KLBP). This month, Long Beach Public Media (LBPM) announced that residents of West Long Beach, the Greater Downtown area, San Pedro and Wilmington can tune in to station 99.1FM to listen, while anyone can check out the online stream at klbp.org. From 17 pre-recorded pilot programs, including the Cosmic Spot with host Michael Walsh bringing listeners experimental and electronic music, to Israel Hour, with Josh Shron presenting a selection of Israeli music, news, discussions and interviews, KLBP’s low-power FM station now airs a 36-hour continuous loop from its transmitter at the Port of Long Beach. The shows were selected from a pool of more than 100 submissions, with additional programs to be developed, including segments from Long Beach media outlets LB Report, Padnet as well as the Long Beach Post. And with 168 hours to fill a week, KLBP is looking to take on even more local voices. Shows can be submitted through the website here. KLBP will soon have a studio and educational facility at 209 Pine Ave. thanks to Ron Hodges, owner of Shannon’s on Pine sports bar, who was the station’s earliest backer and donated the space and covered the building costs. At the time of the announcement on Dec. 19, the station’s staff was expected to move in by January. 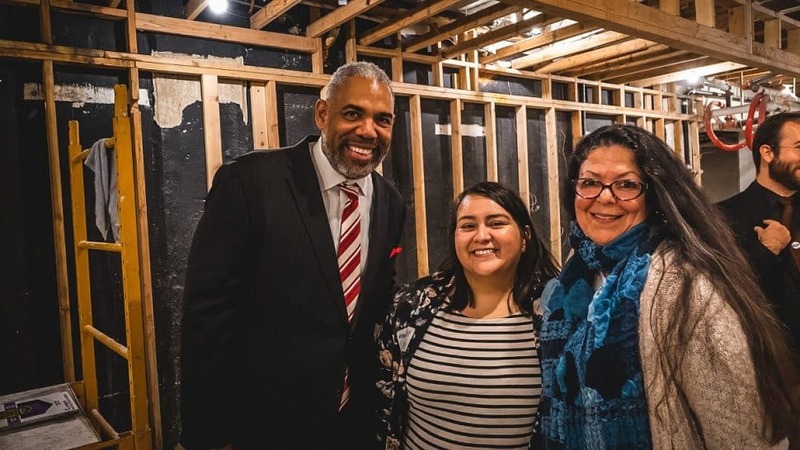 Darick J. Simpson, Executive Director of LBCAP, Ashley Aguirre, President of Long Beach Public Media/KLBP and Sherry Diamond, a member of KLBP’s Advisory Council gather during a recent studio tour. Courtesy LBPM. Another backer of the project includes the Long Beach Community Foundation, which granted the nonprofit $40,000 from the Knight Foundation to help launch the station. LBPM is also running a GoFundMe campaign to support its 2019 operating budget and future costs. On Nov. 26, the Harbor Commission approved a lease to install the station’s antenna on a 168-foot tower on the Port’s property. Since Tuesday, Dec. 18, KLBP has been up and running. Bix Mix — Longtime LB musician and DJ, Brett Bixby, takes you on an eclectic journey through genre and groove. California Country Show — Hosts Just Dave and Casey Cannon explore the many movements and scenes influenced by California Country music. Catbluz — Turn it up real loud and celebrate the blues with host Gilbert “Catfish” Mares. Cosmic Spot — Join host Michael Walsh for the latest sounds in electronic music ranging from house to experimental. Dancing on the Astral Plane — DOTAP is a show about the intersection of ethereal spirituality and the experience of music hosted by Rose Lozon. GoGo Boots Radio Hour — Great music, from any and everywhere. Kenny Field curates a mix of local bands and talent from around the world. Israel Hour — From classic favorites to contemporary hits, Josh Shron brings you a selection of Israeli music, news, discussion, and interviews. It’s a GAS! — Steve Blue relives the Great American Songbook through the standards and more. The Lunar Saloon — Ron Husges aka “Floppy Disco” brings you an aural soundtrack fusing psychedelic space rock, cosmic disco, synth-pop, jazz funk, italo disco, easy listening, electro, boogie funk, library music, and more! Magus Elgar (Audio Drama) — Discover the wonders of property damage as Magus Elgar deals with the strangest magic he’s ever witnessed: science! Sounds from the Basin — Local musician, Matt Cohn dives into the LA basin’s rich music history. The Westerino Show — Dean Westerfield and Jeff Guarino present an eclectic mix of music and comix reviews, highlighting experimental punk and jazz and rock and instrumental sounds, along with in-depth analyses of independent and underground comix and graphic novels. The Whole Way Through — After listening to the entirety of a local musician’s album, host Talon Stradley sits down with the artist to discuss everything that went into its creation.